Our latest show is hitting the arts markets! Blackbird Ensemble are attending APAM and PANNZ arts markets with their show ‘All is full of love.’ Take a look at some of the footage from this explosively creative show above, and some of the photography by Loork below. We are putting this out to the world to see if it reaches her eventually! There are very few artists like you. We admire your work, your passion, your originality and your dedication to music and performing. you and your incredible life’s achievements. nothing and creating musical experiences to envelope us all in a sense of magic and a belief that anything is possible. and creating new versions of your work, performed by a 10 piece band and 4 of NZ’s best singers. We hope we can do your work justice. We look forward to hearing from you, and hope that you will do us the honour of your attendance. Here is a video from a few years ago where we covered your song Pluto as part of our Night Sky themed concert. The singer is NZ’s Jessie Cassin. It’s with excitement that we announce our soon to be released album from our live show Dreams. Recorded in Dec 2016 as a full ensemble, the collection of songs from ‘Dreams’ includes some beautiful musical alchemy from musicians including Callum Passells (Sax, clarinet), Kevin Keys (Trombone, Ukulele, Vocals) Jessie Cassin (Vocals) Tristan Deck (Drums) Charmian Keay (Violin) Claire Cowan (Banjo, Cello, Keys) Mikey Brown (Vocals, Guitar) Jonnie Barnard (Guitar) Jonathan Burgess (Bass). The album will include our own versions of songs by artists including Iron and Wine, Radiohead, Stravinsky, Amy Winehouse, Loudon Wainwright, The Smiths, Claire Cowan, The Cure and Beth Orton. We’re very excited to release this to the world in June. Keep your ears open! “The Basement was magically morphed into a bed-strewn boudoir for Blackbird Ensemble’s latest sortie into chamber music cabaret. Dreams came with devious intent as the group’s founder, Claire Cowan, urged us to let our minds run away with their desires and anxieties into a landscape that could be either thrilling or terrifying. And who could resist, as the nine musicians woke up in their nightwear, rendering their first lullaby? A wide-ranging playlist showed Cowan’s songbook is eclectic and classy. At its most energetic, a rip-roaring Nick Cave number (I Had a Dream, Joe) strutted in a snappy arrangement that could have been the missing link between Kurt Weill and Tom Waits. On the gentler side, there was the wistful Gillian Welch closer, with each instrument having its intimate conversation with Jessie Cassin’s tender vocals. Colours dazzled, from an mbira duet signing off a Smiths song, to Callum Passells’ impressive shifts from sax and clarinet to world-weary accordion. There was a curatorial zest in mashing songs together. Who would have thought that 80s vintage Smiths could partner a wry Loudon Wainwright lullaby from a decade before? Later, an elegant Piazzolla tango encased Cassin’s smouldering tribute to Nina Simone in Don’t Smoke in Bed. Instrumentally, these players caught the linear cool of Stravinsky, deftly arranged by Cowan, yet broke out and bloomed in moments of freedom. Kevin Keys’ trombone, sliding into the nostalgia lounge for ’60s Mancini, was a definite highlight. With Daniel Williams’ imaginative set exquisitely lit by Rachel Marlow and Brad Gledhill, this stylish divertissement was beautifully paced by director Renee Lyons. In the final count, though, the musicians made the show, centred on the vocal contributions of the inexhaustible Cassin and the soulful Mikey Brown. Jonathan Burgess moved as effortlessly between electric and acoustic bass as Cowan balanced cello with banjo. Tristan Deck was molto simpatico as a top-notch percussionist must be, while Charmian Keay offered glamour and fine fiddling, on and off the bed. And let’s not forget a particularly sleek guitar solo from Jonnie Barnard that would have had Gillian Welch herself beaming. 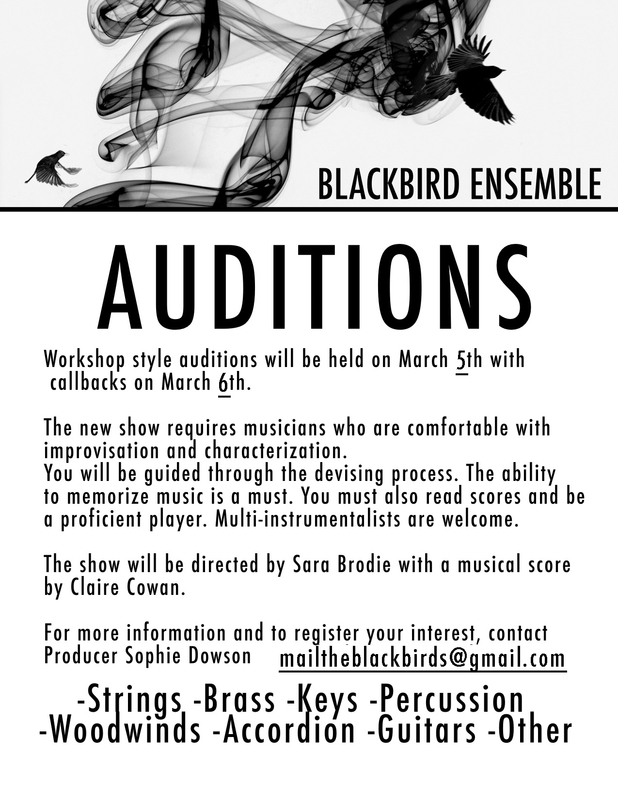 The Blackbirds have come up with a dream of a show. Don’t miss it.